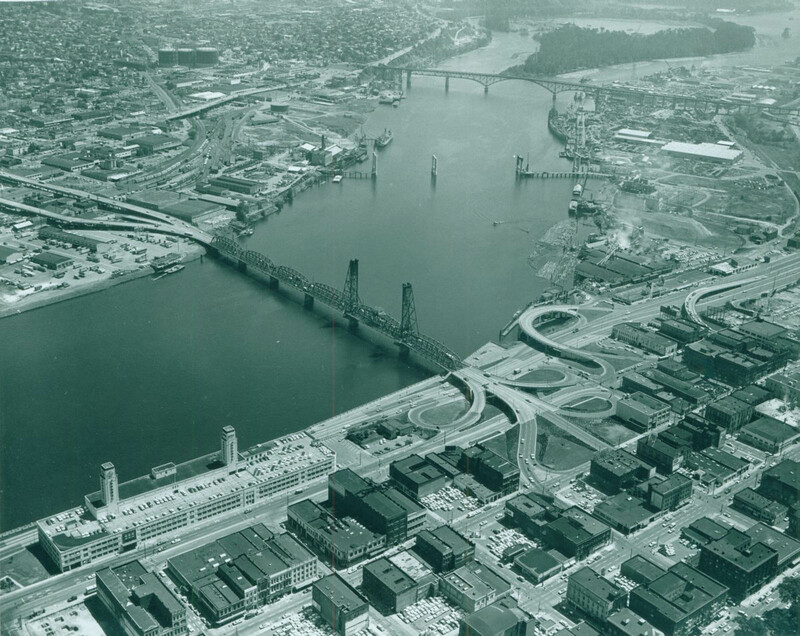 Here’s a pretty aerial view of Southwest and Southeast Portland along the Willamette in 1963. 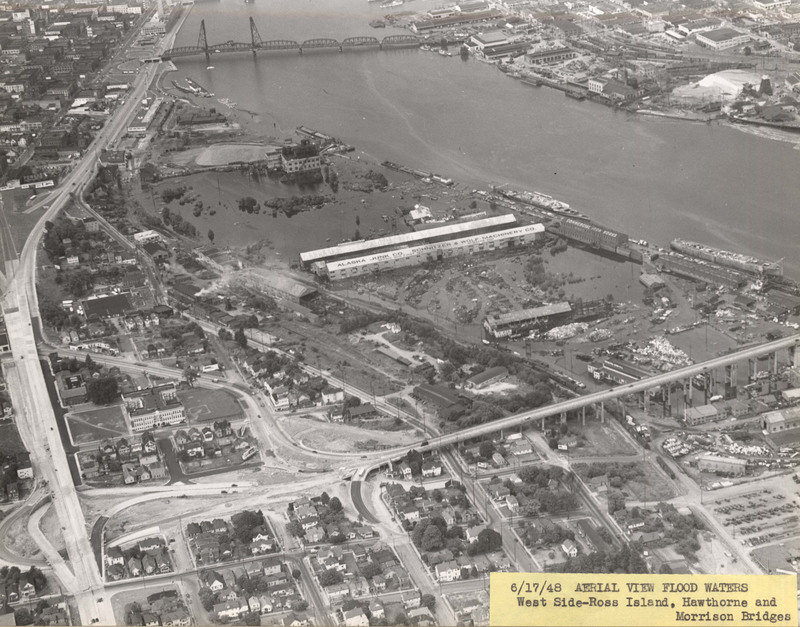 The Marquam Bridge was still under construction and both banks of the river were generally much more industrialized than they are now. Lots of good detail to soak up in this beauty. Crews in 1947 work on the SW Harbor Drive overpass over SW Arthur Street, widening Harbor Dr. and building connections to the Ross Island Bridge. 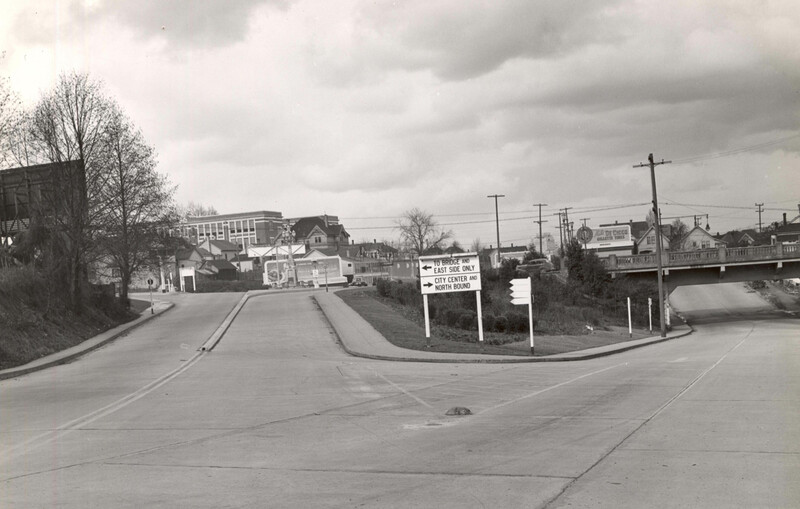 This section of roadway is now SW Naito Parkway and the view is to the southeast. Maybe half of the buildings we see here are still intact. 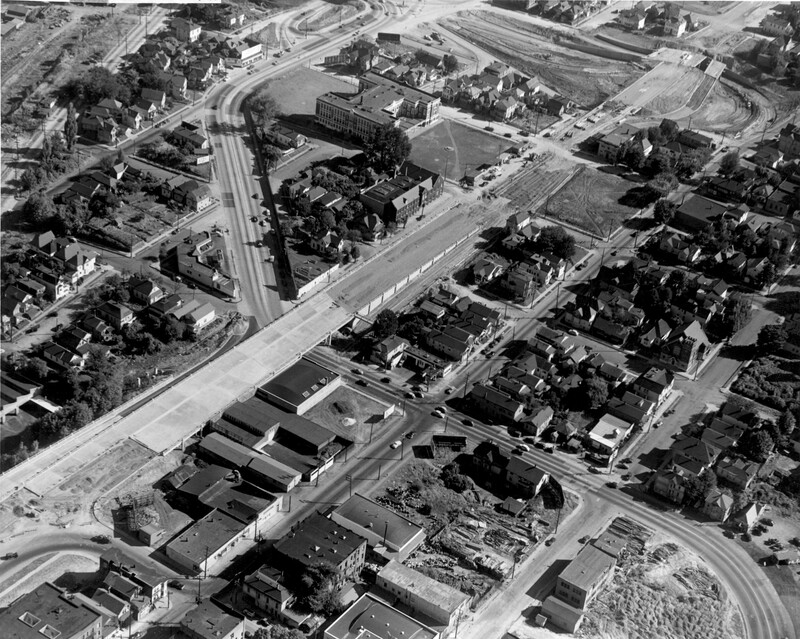 Following yesterday’s post is another look at SW Barbur Blvd, this time a neat aerial from circa 1934. This time the view is to the north with SW Hamilton running left-right across the center. To this day there’s still a little pull-off where the car sits at the far left. Thanks to Scott Smith for sending this gem. 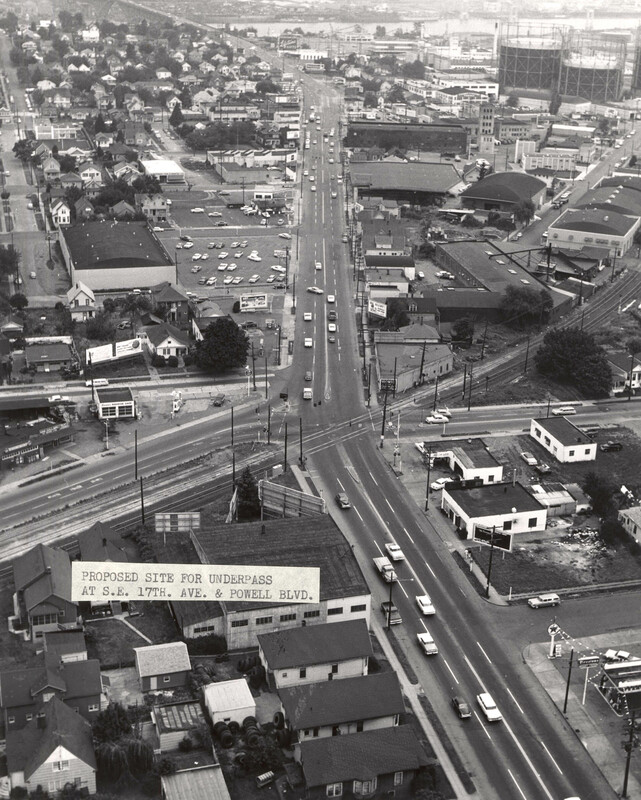 We start the week with a terrific aerial view looking down on SE McLoughlin Blvd. 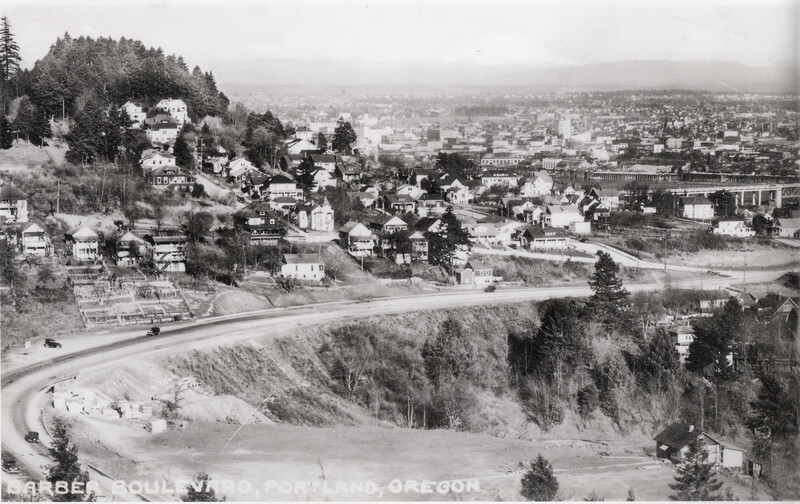 where it crossed over SE Division St. in 1947. The old Inman, Poulsen Lumber Co. sawmill covers much of the lower right side of the image, stretching down to the Ross Island Bridge. The Consolidated Dairy Products plant and the Portland Coke & Gas Co. storage tanks can be seen farther inland. Recent realignment of the McLoughlin/MLK overpass allows the new Oregon Rail Heritage Center to sit just north of the extant Inman Poulsen office at photo center. SW Kelly Avenue dips under the west end of the Ross Island Bridge on its way north to downtown. The diagonal on the left takes drivers up to Corbett Ave and access to the bridge. You can see an aerial view of the same area in this earlier VP post. Yesterday’s post showed traffic stopped for the train at SE Powell & 17th Avenue. 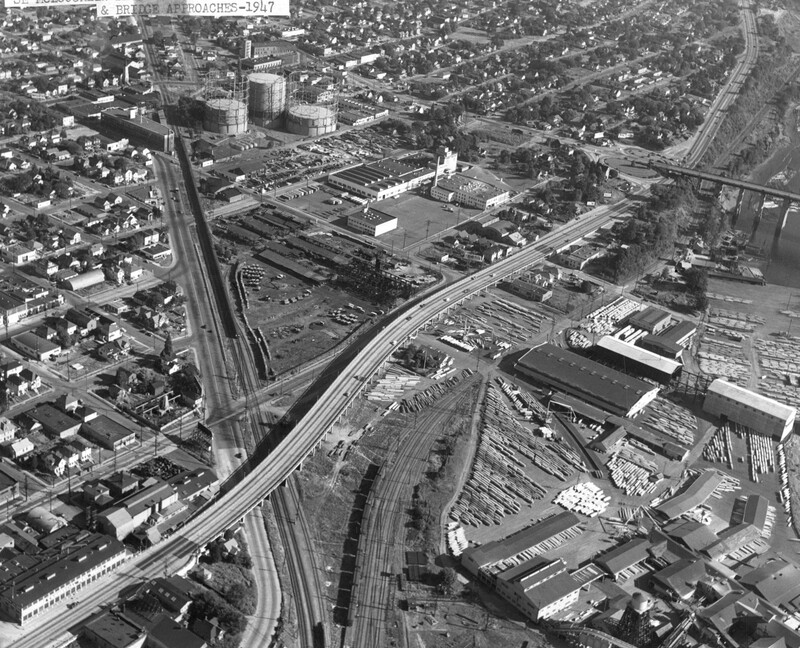 This photo from the following year shows the same area from the air, apparently part of an aerial survey in preparation for building the underpass. Lots of good detail in this image. High water during the flood of June, 1948, inundate low-lying and unprotected areas of Portland’s south waterfront and Ross Island Bridge.